A few weeks ago, LADOT Bikeways staff grabbed our camera and tripod and took a trip down to Long Beach to get a first hand look at the Vista St. Bicycle Boulevard. As Los Angeles gets ready to implement it’s own version of a Bicycle Boulevard (called a Bicycle Friendly Street – BFS), we wanted to help familiarize everyone with a few of the different treatments. We particularly wanted to stress the significant quality of life and safety improvements that Vista St. residents have seen following the installation of traffic calming devices – particularly roundabouts and bicycle traffic signals. We hope to use this video (and others like it) at future neighborhood meetings to provide information through a more visually appealing medium. Special thanks go out to Long Beach Bicycle Coordinator Allan Crawford, neighborhood residents Kristine Kelly and Lisa Brisky for sharing their first hand thoughts and experiences with the facility. More on the benefits of BFS facilities below the fold. The LADOT Bike Program is excited to announce that we have created some fun and educational posters to display at this October’s CicLAvia event. There are three different poster designs with concepts that are informative, celebratory, and forward looking. Be on the look out for them at select locations along the route. 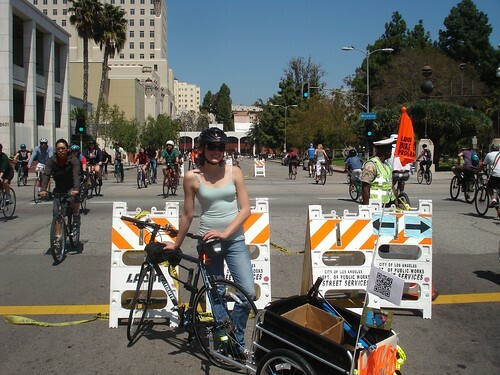 Also, the LADOT Bike Program will be at CicLAvia pulling a trailer full of goodies that include (but are not limited to) bike maps, LADOT water bottles, bike lights, pencils, and pins; so don’t be shy, pull us over and get some swag. More on the posters below the fold. 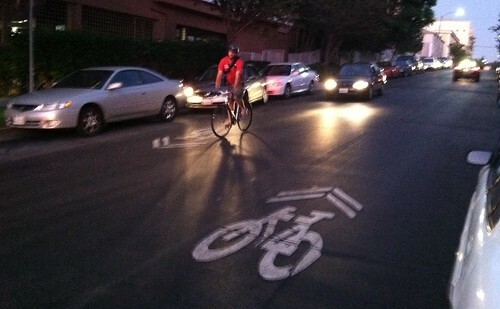 4th St. sharrows in action at dusk last week. Over the weekend, 20 more miles of sharrows were installed. About a month ago, we announced that sharrows were good, and discussed LADOT’s plans to install them on select streets citywide before the year’s end. We are happy to report that this past weekend, LADOT work crews installed approximately 20 miles worth of these bicycle facilities on L.A. streets. All told, 797 sharrows were laid down, adding 20.61 miles of bicycle infrastructure to L.A. streets. A majority of those sharrows were installed using HOT TAPE thermoplastic – a highly durable, visible, and skid resistant road marking material. However, some sharrows on Motor Ave. and Heliotrope Dr. were installed using paint. Rest assured, the paint is a temporary treatment as segments of these two respective streets are set to be resurfaced in the near future. Once the streets are resurfaced, more permanent thermoplastic sharrows will be installed. 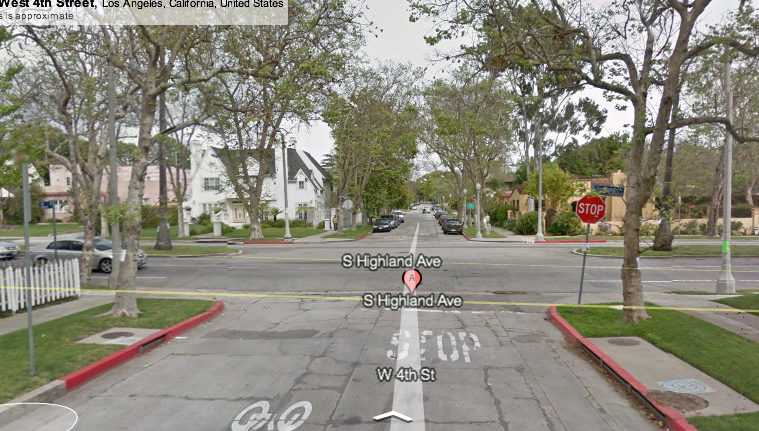 While 4th St. outreach and planning continues (Bikeways staff met with 4 neighborhood councils and an HOA), Councilmember Tom La Bonge announced at a recent Greater Wilshire Neighborhood Council meeting that he is opposed to the installation of bicycle/pedestrian signals at Highland and Rossmore, and has requested that we focus our ongoing conceptual design plans on Hoover St. to Wilton Pl., instead. The proposed bike/ped signals were to address the two toughest intersections for bicyclists to cross on 4th St. between Cochran Ave. and Hoover St.; the intersections would have been designed to prohibit cut through traffic. La Bonge has asked our group to look at 6th St. as an alternative, but this corridor is not an option as it’s not in the Council adopted Bike Plan. 4th St. is currently designated as a Class III bicycle route, and now has shared lane markings as well as bicycle friendly loop detectors at signalized intersections. In the fall, we’ll start outreach on a grant we received to do bicycle wayfinding signage–and 4th St. will definitely be included. Moving forward, which intersections do you think need special attention on 4th Street? Which destinations should be highlighted along 4th St. (for our fall wayfinding project)? And, where should we look next to implement Bicycle Friendly Street measures? (Ed Note: Most information on Bicycle Friendly Street treatments come from the Technical Design Handbook in the 2010 LA Bike Plan. Though we are happy to present it in bite-sized pieces, we highly recommend you download it yourself and have a good read. You can download the Technical Design Handbook here. For a refresher on what a Bicycle Friendly Street is check out our BFS tab by clicking here. You can also find previous posts on signage, chicanes, round-a-bouts, loop detectors and other BFS treatments here. We’re back with another installment in our long running series “Anatomy of a Bicycle Friendly Street.” Today, we look into the particulars of the traffic control device known as bicycle signals. Bicycle signals are basically traffic signals for bikes. They provide bikes (and by extension pedestrians) with their own dedicated signal phase, which allows them to safely cross intersections. The Bike Plan’s Technical Design Handbook dictates that bike signals in the City of Los Angeles may be used to improve an identified safety or operational problem involving bicycles making them ideally suited for utilization at busy intersection along the Neighborhood Network. More on bike signals below the fold. Update: There has been some confusion regarding the draft concept treatments. Again, these images are concepts, only. 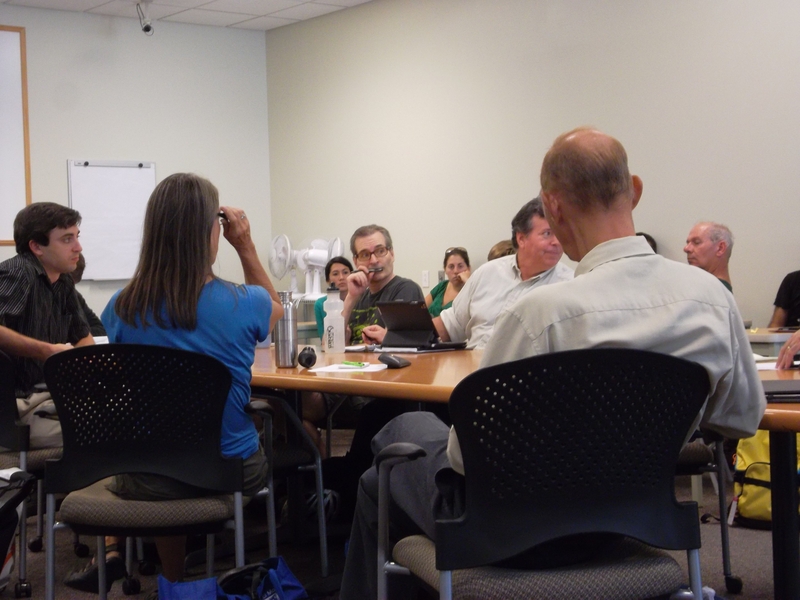 To date, no design work has been completed as DOT continues the public outreach process. We have created a new draft concept for Highland/4th that we feel more clearly represents the intersection(s) at Rossmore and Highland. This new image highlights the signal head for the bicycle/pedestrian actuated signal on 4th Street. Regarding turn movements onto 4th St. from Highland or Rossmore; there will be no restriction on turn movements (right or left) onto 4th Street from either Highland or Rossmore. The only restrictions will be for through movements on 4th through Highland or Rossmore (motor-vehicles will be forced to make a right while bicycles and pedestrians are unrestricted). 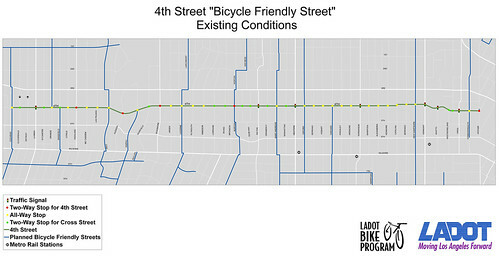 Since Bicycle Friendly Street’s are a new concept for the City of Los Angeles, local residents may have some questions about the effects of various treatments. 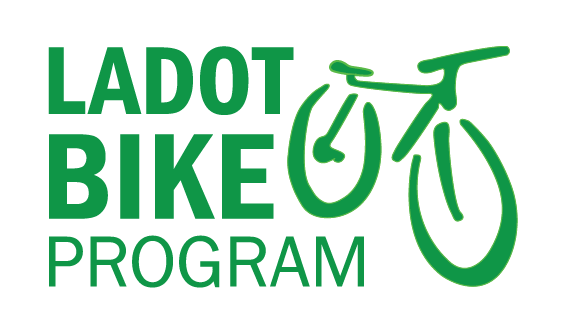 We here at the LADOT Bike Program are happy to address any questions and concerns that residents may have concerning the Bicycle Friendly Street pilot project. We encourage residents to attend local meetings, or if you can’t make those, feel free to leave us a comment on the blog and we will be sure to pass your concerns on to the appropriate staff. Below the fold we discuss the rationale for bike friendly treatments and present concepts for 4th/Highland and 4th/New Hampshire. Also, before we continue, just a friendly reminder that these concepts do not represent final designs and are merely intended to help visualize potential treatments.